Twelve countries represented by the Governments of Argentina, Australia, Belgium, Chile, the French Republic, Japan, New Zealand, Norway, the Union of South Africa, the Union of Soviet Socialist Republics, the United Kingdom of Great Britain and Northern Ireland, and the United States of America, signed the Antarctic Treaty on 1 December 1959 in Washington. The present Treaty shall not prevent the use of military personnel or equipment for scientific research or for any other peaceful purpose. scientific observations and results from Antarctica shall be exchanged and made freely available. In implementing this Article, every encouragement shall be given to the establishment of cooperative working relations with those Specialized Agencies of the United Nations and other international organizations having a scientific or technical interest in Antarctica. prejudicing the position of any Contracting Party as regards its recognition or non-recognition of any other State‚s rights of or claim or basis of claim to territorial sovereignty in Antarctica. No acts or activities taking place while the present Treaty is in force shall constitute a basis for asserting, supporting or denying a claim to territorial sovereignty in Antarctica or create any rights of sovereignty in Antarctica. No new claim, or enlargement of an existing claim, to territorial sovereignty in Antarctica shall be asserted while the present Treaty is in force. Any nuclear explosions in Antarctica and the disposal there of radioactive waste material shall be prohibited. In the event of the conclusion of international agreements concerning the use of nuclear energy, including nuclear explosions and the disposal of radioactive waste material, to which all of the Contracting Parties whose representatives are entitled to participate in the meetings provided for under Article IX are parties, the rules established under such agreements shall apply in Antarctica. The provisions of the present Treaty shall apply to the area south of 60° South Latitude, including all ice shelves, but nothing in the present Treaty shall prejudice or in any way affect the rights, or the exercise of the rights, of any State under international law with regard to the high seas within that area. In order to promote the objectives and ensure the observance of the provisions of the present Treaty, each Contracting Party whose representatives are entitled to participate in the meetings referred to in Article IX of the Treaty shall have the right to designate observers to carry out any inspection provided for by the present Article. Observers shall be nationals of the Contracting Parties which designate them. The names of observers shall be communicated to every other Contracting Party having the right to designate observers, and like notice shall be given of the termination of their appointment. Each observer designated in accordance with the provisions of paragraph 1 of this Article shall have complete freedom of access at any time to any or all areas of Antarctica. All areas of Antarctica, including all stations, installations and equipment within those areas, and all ships and aircraft at points of discharging or embarking cargoes or personnel in Antarctica, shall be open at all times to inspection by any observers designated in accordance with paragraph 1 of this Article. Aerial observation may be carried out at any time over any or all areas of Antarctica by any of the Contracting Parties having the right to designate observers. 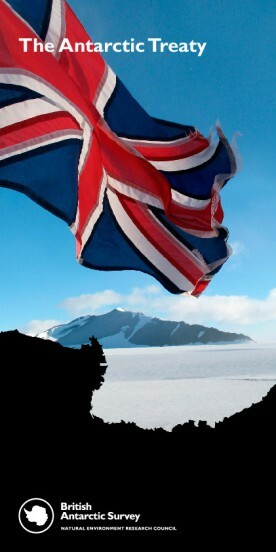 any military personnel or equipment intended to be introduced by it into Antarctica subject to the conditions prescribed in paragraph 2 of Article I of the present Treaty. In order to facilitate the exercise of their functions under the present Treaty, and without prejudice to the respective positions of the Contracting Parties relating to jurisdiction over all other persons in Antarctica, observers designated under paragraph 1 of Article VII and scientific personnel exchanged under sub-paragraph 1(b) of Article III of the Treaty, and members of the staffs accompanying any such persons, shall be subject only to the jurisdiction of the Contracting Party of which they are nationals in respect of all acts or omissions occurring while they are in Antarctica for the purpose of exercising their functions. preservation and conservation of living resources in Antarctica. Each Contracting Party which has become a party to the present Treaty by accession under Article XIII shall be entitled to appoint representatives to participate in the meetings referred to in paragraph 1 of the present Article, during such times as that Contracting Party demonstrates its interest in Antarctica by conducting substantial research activity there, such as the establishment of a scientific station or the despatch of a scientific expedition. Reports from the observers referred to in Article VII of the present Treaty shall be transmitted to the representatives of the Contracting Parties participating in the meetings referred to in paragraph 1 of the present Article. The measures referred to in paragraph 1 of this Article shall become effective when approved by all the Contracting Parties whose representatives were entitled to participate in the meetings held to consider those measures. Any or all of the rights established in the present Treaty may be exercised as from the date of entry into force of the Treaty whether or not any measures facilitating the exercise of such rights have been proposed, considered or approved as provided in this Article. If any dispute arises between two or more of the Contracting Parties concerning the interpretation or application of the present Treaty, those Contracting Parties shall consult among themselves with a view to having the dispute resolved by negotiation, inquiry, mediation, conciliation, arbitration, judicial settlement or other peaceful means of their own choice. Any dispute of this character not so resolved shall, with the consent, in each case, of all parties to the dispute, be referred to the International Court of Justice for settlement; but failure to reach agreement on reference to the International Court shall not absolve parties to the dispute from the responsibility of continuing to seek to resolve it by any of the various peaceful means referred to in paragraph 1 of this Article. The present Treaty may be modified or amended at any time by unanimous agreement of the Contracting Parties whose representatives are entitled to participate in the meetings provided for under Article IX. Any such modification or amendment shall enter into force when the depositary Government has received notice from all such Contracting Parties that they have ratified it. Such modification or amendment shall thereafter enter into force as to any other Contracting Party when notice of ratification by it has been received by the depositary Government. Any such Contracting Party from which no notice of ratification is received within a period of two years from the date of entry into force of the modification or amendment in accordance with the provision of subparagraph 1(a) of this Article shall be deemed to have withdrawn from the present Treaty on the date of the expiration of such period. If after the expiration of thirty years from the date of entry into force of the present Treaty, any of the Contracting Parties whose representatives are entitled to participate in the meetings provided for under Article IX so requests by a communication addressed to the depositary Government, a Conference of all the Contracting Parties shall be held as soon as practicable to review the operation of the Treaty. Any modification or amendment to the present Treaty which is approved at such a Conference by a majority of the Contracting Parties there represented, including a majority of those whose representatives are entitled to participate in the meetings provided for under Article IX, shall be communicated by the depositary Government to all Contracting Parties immediately after the termination of the Conference and shall enter into force in accordance with the provisions of paragraph 1 of the present Article. If any such modification or amendment has not entered into force in accordance with the provisions of subparagraph 1(a) of this Article within a period of two years after the date of its communication to all the Contracting Parties,any Contracting Party may at any time after the expiration of that period give notice to the depositary Government of its withdrawal from the present Treaty; and such withdrawal shall take effect two years after the receipt of the notice by the depositary Government. The present Treaty shall be subject to ratification by the signatory States. It shall be open for accession by any State which is a Member of the United Nations, or by any other State which may be invited to accede to the Treaty with the consent of all the Contracting Parties whose representatives are entitled to participate in the meetings provided for under Article IX of the Treaty. Ratification of or accession to the present Treaty shall be effected by each State in accordance with its constitutional processes. Instruments of ratification and instruments of accession shall be deposited with the Government of the United States of America, hereby designated as the depositary Government. The depositary Government shall inform all signatory and acceding States of the date of each deposit of an instrument of ratification or accession, and the date of entry into force of the Treaty and of any modification or amendment thereto. Upon the deposit of instruments of ratification by all the signatory States, the present Treaty shall enter into force for those States and for States which have deposited instruments of accession. Thereafter the Treaty shall enter into force for any acceding State upon the deposit of its instruments of accession. The present Treaty shall be registered by the depositary Government pursuant to Article 102 of the Charter of the United Nations.